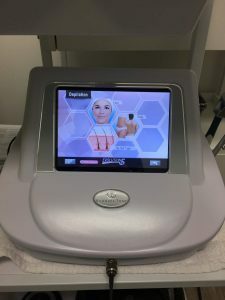 You have heard and seen us talk about Electrolysis but it has come to our attention that not many people are aware of Electrolysis let alone what the benefits are. Simply put Electrolysis is a method of removing individual hairs from the face or body. Electrolysis destroys the growth centre of the hair (which is the hair follicle) with energy. A very fine probe is inserted into the hair follicle, it is then hit with a burst of energy and then the hair is removed with tweezers. Did you know – Electrolysis is older than Laser Hair Removal? Many years ago, men and women were getting Electrolysis treatments done to get rid of unwanted hair. Unlike Laser Hair Removal, there are very few limitations to Electrolysis. 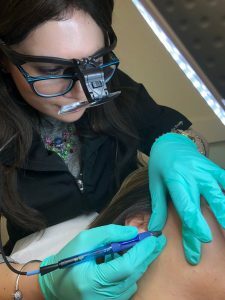 With Laser Hair Removal, hair can only be treated if the hair has colour; clients with light, white or very fine hair are not good candidates for Laser Hair Removal. Electrolysis is colour blind, it does not matter what colour the hair is – if the hair is visible, it can be treated. Sounds great right? It is! There is a catch with Electrolysis, the hair must be visible in order for the Electrologist to be able to capture and treat the hair. With Electrolysis, there is no shaving, tweezing, plucking or waxing involved. The hair has to grow in order to be treated. But on the upside, Electrolysis can be done at any time, unlike Laser Hair Removal, Electrolysis can be done on a weekly basis if needed. Now I’m sure you have many questions at this point. Let’s answer the basics right now. Question – Is Electrolysis permanent? Question – Is Electrolysis painful? Answer – No. With the latest technologies, Electrolysis is now a pain free experience. Where things can get a tad uncomfortable is extremely sensitive areas such as the tip of the nostrils and the lip line. Question – How many treatments do I need? Answer – It really depends on various factors that include hair type, density, hormones and the hair growth as a whole. What needs to be understood is that hair follicles are not straight; the needles used with Electrolysis are straight. When treated, hair follicles are eventually straightened and when they are straight, it is at that time that the hair follicle can be killed. This may take on average about five or six treatments on the follicle. Question – Can Electrolysis be done during Laser Hair Removal Treatments? Answer – Yes. We recommend that Electrolysis treatments be scheduled two to two and a half weeks after a Laser Hair Removal Treatment. This ensures that all the hair targeted by the Laser has the chance to fall before another treatment is performed. Question – How often can I come in for Electrolysis? Answer – Appointments for Electrolysis can be done as often as the hair is visible. It is not uncommon for clients to be coming once a week. An average schedule is once every two weeks. Question – Do I have to shave before an Electrolysis appointment? Answer – No. The hair to be treated cannot be shaved. The hair needs to be above the skin, it needs to be visible in order for the Electrologist to perform the treatment properly and safely. Electrolysis is safe, effective and comfortable. It is a great accompaniment to Laser Hair Removal and a good option for those clients who are not suited candidates for Laser Hair Removal. We are very proud and happy to offer the latest and greatest technologies in Electrolysis. With the Evolution 5HD from Silouhette Tone we are able to provide a wide range of strengths and power to ensure that all hair is treated safely and effectively. Call us now to book your free consultation and experience the complete freedom of Hair Removal!